"Hurt Go Happy" is American Sign Language for "the pain has ended." Thirteen-year-old Joey Willis has been deaf since the age of six, and is used to being left out of conversations. Her mother has never allowed her to learn sign language, so she must strain to read the lips of those around her with little success. While mushroom-hunting one day, Joey meets Dr. Charles Mansell, who has recently returned from Africa with Sukari, a baby chimpanzee. Charlie’s parents were deaf, and he and Sukari communicate using sign language. Joey secretly begins to learn to sign. Visits with Charlie and Sukari will be the happiest of Joey’s life, but ultimately, as her choices broaden, Charlie’s and Sukari’s begin to narrow until Sukari’s very survival is in doubt. 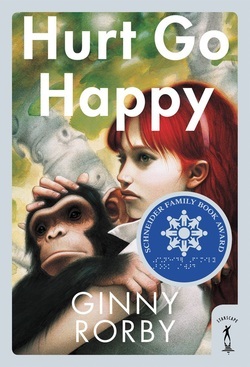 Inspired by the true story of Lucy Temerlin and Nim, chimpanzees raised like human children, and the culmination of ten years of research, Hurt Go Happy is the heartbreaking but ultimately uplifting story of one girl's determination to save the life of a fellow creature-one who shares ninety-eight percent of our DNA and the ability to communicate her pain. The teacher says: "Because of your book, their lives have been and will be radically changed. They would always ask if we could read one more chapter or stay past the bell just a few more minutes. They truly understand the feeling I-just-can’t-put-it-down. To me, I saw a miracle happen in my classroom. For maybe the first time in their lives, they fell in love with a book. This is the video the deaf students made for HGH. You may have to cut and paste. Should we keep animals capable of feeling, and expressing pain and fear, in cages and test chemicals on them? 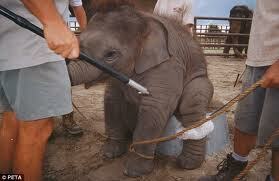 Is it worth doing this to a baby elephant? 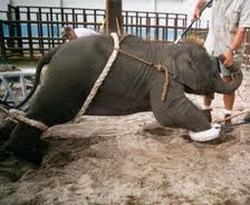 To see it do this at a circus?